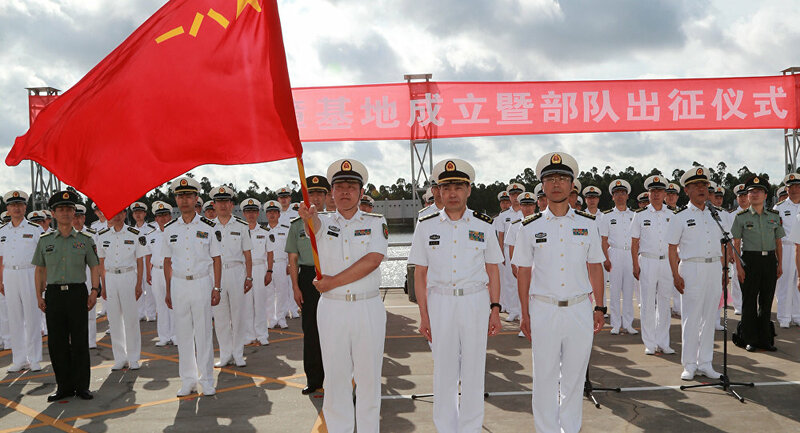 The opening ceremony of China's first overseas military base, a naval logistical facility of the Chinese People's Liberation Army (PLA), took place on Tuesday in Djibouti on the Horn of Africa, Chinese media reported. SHANGHAI (Sputnik) – According to the CCTV news channel, the ceremony, comprising five Chinese military units and Djibouti's ceremonial guard, coincided with the celebrations of 90th anniversary of the PLA. On July 11, the Chinese Defense Ministry officially announced the establishment of the naval logistics center in Djibouti and sent its military personnel there. China announced construction of a logistical facility in Djibouti in February 2016. The center was expected to be used by the Chinese patrol boats in the Gulf of Aden and other areas and serve as supplies center and a recreation facility for sailors, according to Chinese Defense Ministry spokesman Wu Qian. Djibouti is located on the Horn of Africa and borders with Eritrea, Ethiopia, Somalia, the Red Sea and the Gulf of Aden, being plagued by piracy. China has been actively participating in anti-piracy measures in the region.